Directory submission best SEO(Search Engine Optimization)Trick. And it is the processing of listing own your site.if you want to high page rank own site, Then you can submit URL(Uniform Resource Locator) on directory submission sites.It is call directory submission. If You want to create back-links then you can submit site on Directory submission sites. It is the best service of link building of your site. There are Many types of Directory submission. 2.Paid Directory submission:-It is part of Directory submission but you can approved your site link with in 24 hours.And you can get good back-link some time.so we can say this type of Directory are Paid Directory. 3.Do follow Directory submission:-It is the best service increase your site ranking in SEO. Every Blogger want to good ranking on your blogger.Do follow Directory back-link is very important getting highly ranking of your blogger site. 4.No follow Directory submission. :- You can not submit site in wrong category. 1. You can get safe back-link of your site.And your site ranking is good in search engine. and your site keyword are searching increase. 2.You can increase earning of your blogger site.And increase your site audience.It is the best option of your site ranking. 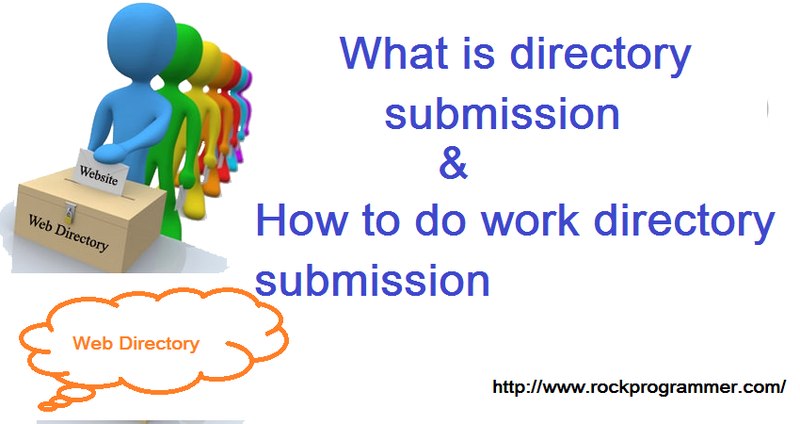 How to do submit your blogger site on Directory submission. After complete detail save the file. Then fill the all information on directory submission site. And go to the google and search high PR rank directory submission sites. Now you have more site list of directory submission.then open the any high PR rank site then fill the details according to site box.so after complete information fill captcha then click on submit button. 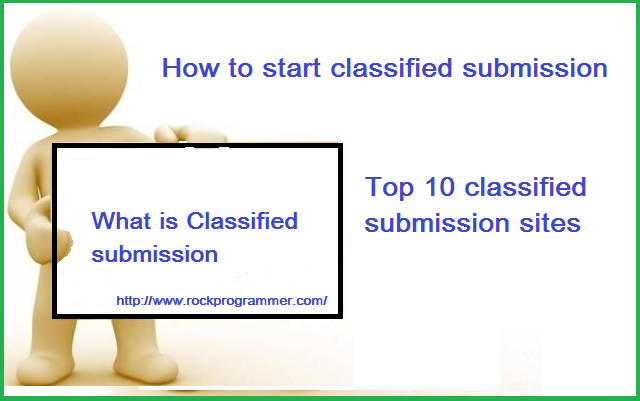 classified submission is the most important part of SEO (search engine optimization). Classified submission ads improve your site keyword and ranking in searching. So we can start easily classified submission. multiple category regarding to adverting. Suppose that you have a training institute, but you want to promote training institute .then you can create ads on classified submission site. but classified submission ads depend on different country India, USA, UK. First off all you need to classified submission sites, then register the classified submission site, After register site you need Title and Description, Company name, and mobile number and email_id and Images.Then fill the information step by step on site. After fill information on site click on button, After some time your ads activate. regarding to find new visitor on your site. SMO is Social Media Optimization .SMO is most important part of SEO search engine optimization (Digital marketing). Social Media are also very large networking, So Social Media Optimization very most important part of internet searching. If you want to promote your site and blogs and e-commerce products then you can share post on social media sites. So you can find good ranking of site in searching.There are many different type social media companies like face-book and Twitter and Instagram Digg Tumbler etc. you can start easily Social media marketing first of all you need to social media sites accounts. And register the account on social media sites,and create the channel on site, then first of all you need to amazing content of your site. If your content is amazing then your site can growth in sometime . Content is very most important in social media marketing. There are some point of social media marketing. 1. Amazing Content of your site:- If your content is amazing so you can find good result in sometime and visitors also increase on your site. 2.Sharing Post:- If you share post regularly then your site fast increase on internet searching. And Visitors also increase. 3.Create Page on site:- It you create page on social site just like Facebook. then you need to first of all followers and likes because your post could be reached on people. SMO Social media optimization are working mostly on page optimization, because social media provide mostly paid service and you can start easily Social media optimization, first of all you need to Social media website just like Facebook and Instagram and Digg etc. SEO search engine optimization provide the on page SEO and off page SEO. SEO means targeted traffic on website and increase the visitors on your sites . SEO is very most important part of your online business.so you can groth business online.